Little bits of random goodness about Tenkara fly fishing gear, technique, and people. I do possess totally nerdy roots as a computer programmer and can remember even as a kid my obsession with what eventually became known as “program bumming” – the removal of code that results in no loss of efficiency (and often, in improvement) or function. To be a bum, was a badge of honor that eventually earned some of my peers a ticket to an early retirement. I chose the far more altruistic, and far less profitable path, of attending University. So I smile a little bit whenever I hear of a “ski bum” or a “hiking bum” or a “fishing bum” and instead of scoffing at them, I study them, because like the programmer who changed the world, these are the guys innovating and changing our favorite pastimes for the better. The only difference between these bums and code bums is of course, the money, which is why you should try to support them instead of upgrading to Windows 8. This brings me to the main point and that is the emergence of the Tenkara Bum, a recent new subspecies of Bum. I joined the Tenkara Bums (has anyone tattooed this yet?) because I’m hopelessly enthralled with this modern day “willow-stick” style of fly fishing. It’s an interesting circle of influence we share, because frankly, there isn’t a lot of gear to buy and there’s precious few skills to learn and master. Like other classes of fishing bums (I’ve been a member in the past and present of groups known as Steelhead Bums, Madison River Bums, Beartooth Plateau Bums, etc. ), I think Tenkara Bums are drawn to each other in search of a common experience, and for Tenkara Bums, it’s simple: we like to catch fish on minimalist tackle, and we like to see each other catch fish on minimalist tackle. Many of the Tenkara Bum Inner Circle found our way here because it was a natural progression from ultralight backpacking and we are finding that Tenkara fishing reflects the ethos we already possess, and have honed, for years. I see the Tenkara Hane is sold out over at Backpacking Light, so I put in another order for them this week. Be sure to sign up for a stock alert if you want to get on the waiting list. We originally developed this as a limited edition. Tenkara was supposed to be a fad, a passing thing. We were supposed to sell enough rods to satisfy the demand of the people who wanted these kooky collapsible willows – you know, like GoLite did with the Breeze. Instead, we commissioned several more production runs, and have had a tough time keeping these in stock (surprise, surprise). There’s a good reason for that, I think, and it’s because they fill a unique niche amongst Tenkara rods: they’re short, and compact. Their short extended length means they are a fantastic option for tight situations where a long rod is unwieldy. I wish it could be even shorter, and I may indeed start playing with shorter designs. Their short compacted length has obvious benefits in that it can be stowed inside a small carryon or pack. Its short length (i.e., 9’10”, or 3m) makes it impractical for big fish, big rivers, and lakes, right? Let’s talk for a moment about ideals vs. practical use. I’m an idealist too, so I recognize that when I’m fishing a big river, playing a big fish, or extended my reach as far as possible, I may want every advantage available. Within the confines of Tenkara fishing, that means I want a long rod. Within the confines of fly fishing, that means a long rod, a reel with disc drag, good double haul technique, and 2X fluorocarbon tippet. Stalking big fish by getting close to them, hooking them, and playing them to shore on a little rod like the Hane is an experience unto itself! In other words, can it be done? Of course it can. It’s up to you — not your gear. There’s a lot of hype about the environmental benefits of bamboo but until somebody can start growing it in my backyard in Montana instead of having to ship it from southeast Asia, I’m probably not inclined to listen to them, and for me, those are not the primary benefits of using bamboo. I love wood. I love art. Bamboo is beautiful. So I designed a Tenkara fly box out of it for Backpacking Light. It should be available in their new Tenkara fly fishing kit, which includes the box, flies, tippet, and some other neat accessories sometime soon. 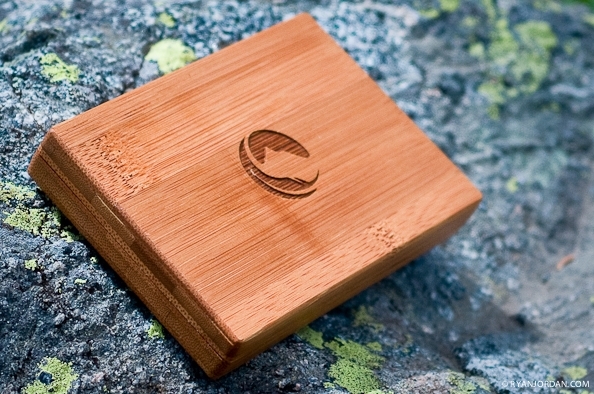 Backpacking Light’s new bamboo fly box, to be launched Fall 2010 as part of an ultrailght Tenkara fly fishing kit. LEICA M9. It’s pretty light too, but not as light as the Morell Foam Fly Box, the creation of which we owe to the likes of BP, Exxon, and others. The Morell is my second favorite box, but only because I didn’t think of it first. The Tenkara-caught trout is best dressed with a Baladeo Knife, sprinkled with sea salt, placed atop a Zia Titanium Grill and cooked over a fire started with a Firesteel Mini, and eaten with a Light My Fire Titanium Spork. The reason I love each of these pieces of gear is because of their (mostly) simple design aesthetic, and the fact that they just plain work. The knife, the grill, and the spork are true works of art. The Firesteel Mini’s aesthetic could benefit from a nice teak handle! 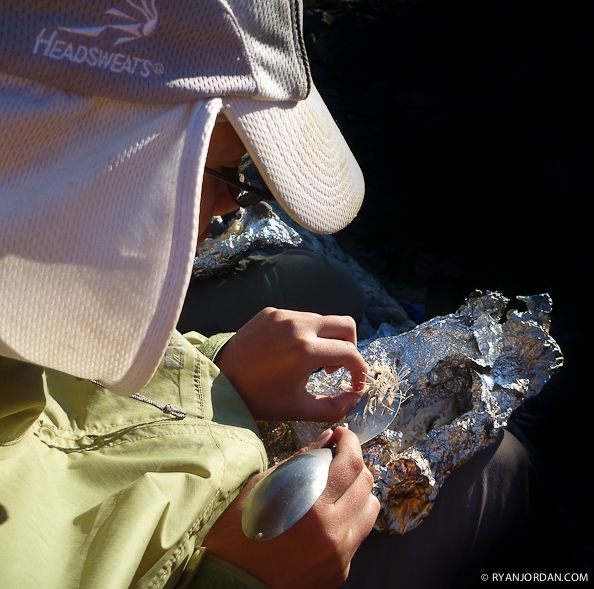 My son Chase, now 12, and a Backpacking Light customer (I wonder if Sam gave him a discount on that titanium spork?). He loves all aspects of trout fishing, and has a special affinity for Tenkara, cooking fish over fire, and eating them. 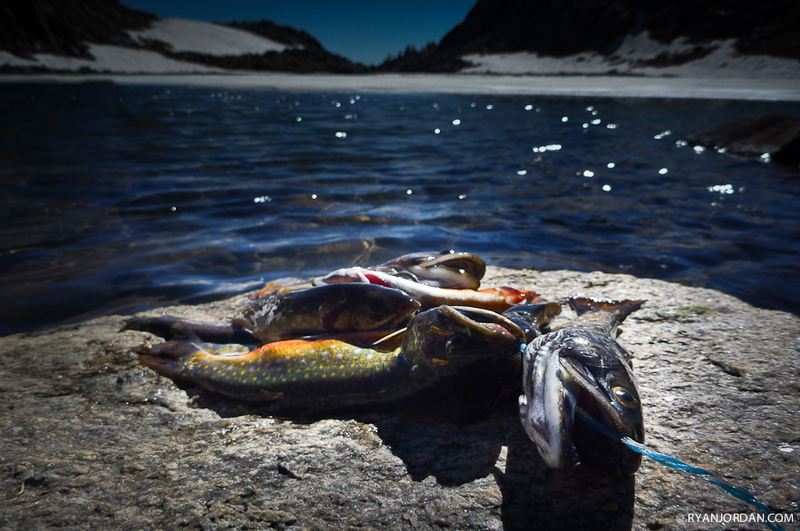 Here he is in the Beartooths this summer enjoying one of the brook trout shown in the stringer in the main photo accompanying this post. PANASONIC DMC-TS1. And yes, this is exactly how I dress, cook, and eat Tenkara trout most of the time. The most important Tenkara skills are not casting or mending and they have nothing to do with knots or flies. The most important Tenkara skills are Vision, and Stealth. With Vision, you can see fish underwater and be like Superman. To have Vision, you need polarized glasses, knowledge of where fish like to hang out, and patience. With Stealth, you can sneak up to within casting range of those fish without them seeing you. To have Stealth, you sometimes need to be willing to crawl, and you always need to both plan your approach, and then have the patience to go slow. With both Vision and Stealth, you can elevate your Tenkara fishing from hobby fishing to real hunting. With both Vision and Stealth, you can find, reach, and catch Big Fish – even with a Hane. In Conclusion: It’s About the Experience, Ya Bum! I’ve said it before and I’ll say it again: Tenkara really isn’t about the gear or the skills, it’s about the experience of catching fish (notice that I didn’t just say “fishing” – how boring is that!) on minimalist gear. It really is a wonderful thing, and I can’t shamelessly promote it enough as a sport in its own right, especially for the ultralight backpacking community. Besides, there are plenty of other support groups out there to help the Tenkara Scoffers, those bums.